Bowling Green, Kentucky applied taxpayer funds to redevelop its downtown despite objections from its most famous resident — Senator Rand Paul. BOWLING GREEN, KY. – When Gary Ransdell, the president of Western Kentucky University, invites alumni to view this city’s redeveloping downtown from his hilltop campus, the response is almost always exclamations of surprise. Just below domed Cherry Hall, one of the 108-year-old university’s grandest buildings, are nearly 200,000 square feet of new student housing, built at a cost of $24 million. There’s also a 30,000 square foot, $10 million alumni center, and a 72,500 square-foot $14.5 million Hyatt Place hotel due to open in 2015. Next door to the Hyatt site is a $28 million mixed use development that is under construction and will house 240 more students on one side of College Street, and a separate building on the other for small businesses, restaurants, and a rooftop pool. There’s also four new fraternity houses built at a cost of $3 million, and a 450-space parking deck flanked by 30,000 square feet of retail businesses and restaurants that are expected to open next year. Mr. Ransdell described the projects closest to the 108-year-old university as the latest additions to the $262 million in downtown construction since 2008 that is rehabilitating Bowling Green’s central business district. All of the new structures replace deteriorated homes and ragged retail businesses that for decades formed a barrier between the university and city center. Bowling Green’s new SKyPac theater is a new downtown institution. Judging from the scope and progress made over the last six years, it clearly appears that deal making has evolved into a choice skill in this city of 61,000 residents, Kentucky’s third largest. Arguably the most important was the pact that the city and Warren County reached with the state to establish a 383-acre, 52-block, special development and tax district in 2007. The district pays local governments 80 percent of the increases in payroll, property, sales and other tax revenue generated by new development within the district boundaries. Revenue is devoted to retiring construction bonds, building infrastructure, and assisting developers, including the university. In August, while on assignment for The New York Times, I reported on Bowling Green’s successful downtown development project, which was made possible its allegiance to the time-honored American principle of devoting public funds for public purposes. It’s that principle of economic development which is under attack from the Tea Party and its adherents in municipal, state, and the federal government. One of the leaders of that anti-tax, anti-spend sentiment is Rand Paul, the Republican junior senator from Kentucky, who has lived in Bowling Green since 1993, where he opened a medical practice in opthamology. Until the Gateway project began to unfold, Bowling Green was largely known for its university, the third largest in Kentucky, and for the General Motors assembly plant not far away, where Corvettes have been built since 1981. Earlier this year a sinkhole opened in a wing of the privately-managed National Corvette Museum near the plant, swallowing eight sports cars that were on display, and prompting significant increases in attendance. Some of the museum’s visitors wander into Bowling Green’s evolving downtown. During a tour Mr. Gorman identifies the steadily expanding galaxy of arts, entertainment, office, and housing projects, big and small, that have quickly risen from blocks that just a few years ago were underused or blighted. For the time being, the development is focused in three distinct hubs. The university, and its 21,000-student market, is heavily influencing construction at the bottom of the Cherry Hall hill, which lies in the southern section of downtown. Near the center of the Gateway project is four square blocks along East 7th Avenue, and State and College streets that form a new entertainment and office district. In 2009, the city completed the 4,559-seat Bowling Green Ballpark, home of the Hot Rods, a Class A minor league affiliate of the Tampa Bay Rays baseball team. The stadium was constructed at a total cost of $30 million, according to city records and is joined to the Hitcents Park Plaza, a $25 million, 106,000-square-foot mixed used office building with restaurants and shops along a street level piazza. The Hitcents building, which opened last year, is named for a growing local digital mobile games and applications company that has its headquarters on the top floor, where 60 of the 15-year-old company’s 80 employees work. The building wraps around the north and west sides of an 800-space parking deck. Mr. Gorman and city leaders await the start of a 48-unit housing development that is planned for the deck’s east side. 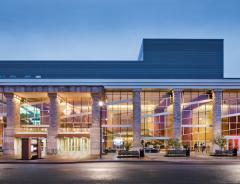 Across 7th Avenue and along College Street, the county completed the $28.5 million, 1,800-seat Southern Kentucky Performing Arts Center, known here as SKyPAC. 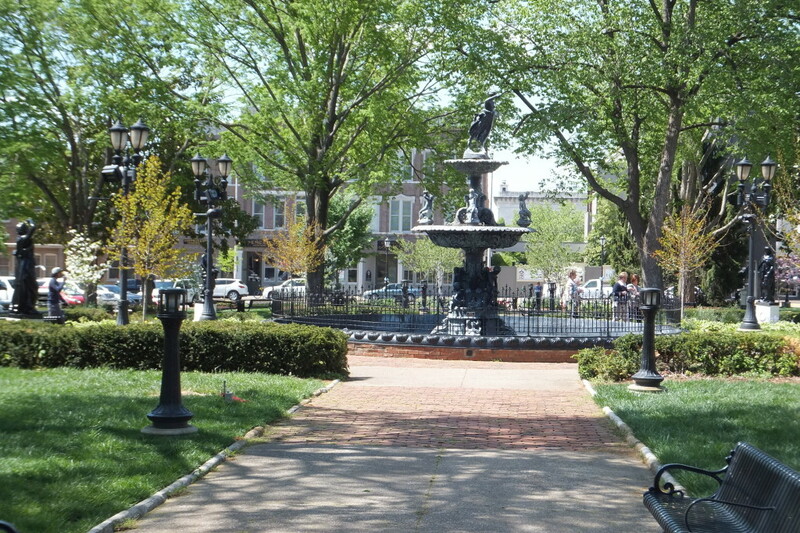 A $2 million park between College and State streets serves as the center’s grand entrance. And on the corner of 7th and College, the Bowling Green Area Chamber of Commerce is housed in a $4 million, 17,000-square-foot office building it completed in 2007. The north end of the development district is dominated by the city’s Medical Center, a regional hospital and healthcare provider. Western Kentucky University constructed a 73,000 square foot, $20 million Health Sciences Complex to house its nursing and physical therapy school. The city’s special development district also has assisted in the planning and construction of a $10 million medical office building, a $3.1 million clinic, a $2.5 million hospitality house for ill children and their families, and $22 million in Medical Center expansion and modernization projects. In all, 28 projects have been completed or are under construction in the Gateway district. The city built a $2.5 million fire station and encouraged the $3.5 million restoration and renovation of an old school for new housing. The scope of the project and its progress, even during the brunt of a national recession, is impressive, except to the elected leaders who’ve negotiated the contracts and shaped the development strategy.